FEMA is committed to increasing the transparency and accessibility of data. 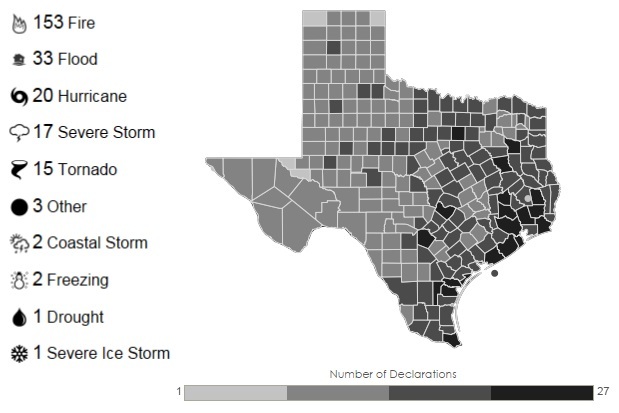 FEMA recently launched a new data visualization tool that enables the public to see when and where disaster declarations have occurred across the country. With hurricane season underway, the tool helps educate people about the history of hurricanes and other disasters in their communities. The Public Data Visualization Tool allows users to view and interact with OpenFEMA data. Through an interactive platform, users can view the history of disaster declarations by hazard type or year and financial support provided to states, tribes, and territories, and access public datasets for further research and analysis. This tool builds off of the beta launch in January where users were able to see a visual representation of federal grant data as it relates to fire, preparedness, mitigation, individual assistance, and public assistance. The FEMA data used in the visualization are from the publicly available datasets on www.fema.gov and www.data.gov. This is a great way to raise awareness about FEMA support and what has happened in my region. thanks for the tools.